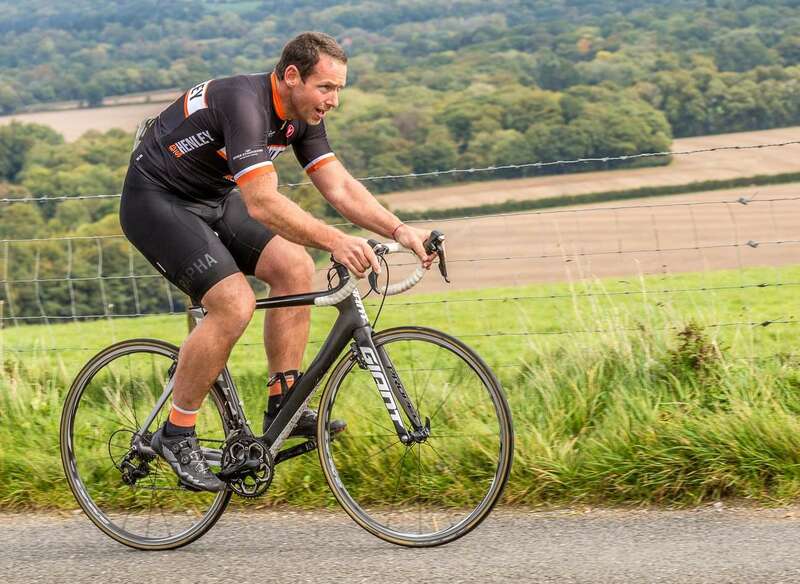 Promoted annually by Newbury Road Club, The Walbury Hill Climb is fast becoming a feature on the annual hill-climbing scene. In past years the event has attracted both the current mens and ladies national champions and a number of well-known hill climb specialists. The hill climb is one of the ascents of the beautiful Walbury Hill (297m/974 feet above sea level), West Berkshire (the highest natural point in Southern England). The course covers a distance of 1883 metres (2,059 yards). After an initial ramp at the start, there is a fairly easy section before the route forks to the left on a narrow lane and ramps up before opening up a view of the scenery on the left. The course then continues up to a final 1:10 ramp, which gives way to a brief level section before the finish line. The course record is held by Tejvan Pettinger: 03:55. Martin Cairns showing it’s all about the aero! The 2017 edition took place on Sunday 1st October 2017 under damp and slightly windy conditions, including quite a stiff head-wind at the summit, but with the road closed to motor traffic. GS Henley was represented in the main event by Matt Hayden and Martin Cairns in a field of 81 riders (including juniors and ladies). A separate ‘come and try it’ event was also held before the main event to allow the uninitiated the opportunity to ride an official hill climb without the pressure of entering the main field, but also enabling riders who missed the sign-on deadline to turn-up on the morning and enter the event. Nick Parris was the sole GS Henley entrant to the come and try it event. The event was made even more attrative with a very generous prize list, not least £500 to the fastest male and female riders. However, the real prize was your body-weight in ale, as being offered by the West Berkshire Brewery to the fastest rider based on their weight! 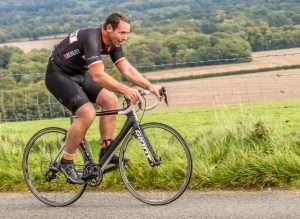 The main event was won outright by Richard Gildea of Didcot Phoenix in a time of 04:11. Richard has been a rising star in the TT world this season and has continued his winning streak elsewhere in local hill climb events. The fastest lady on the day was Joscelin Lowden of Lewes Wanderers CC, with an amazing 04:46. The GS Henley boys were fairly closely matched in the main-field results, with Martin Cairns posting 05:09 and Matt Hayden following close behind on 05:14, for 16th and 18th places respectively. This outcome is especially remarkable given Matt’s atypical climber’s physique (compare photos of the two riders), but importantly, this showing of pure power was suitably acknowledged by Matt taking victory in the body-weight in beer contest! Matt has since collected his spoils and is slowly making his way through no less than 8 cases of bottled West Berks ales – cheers! 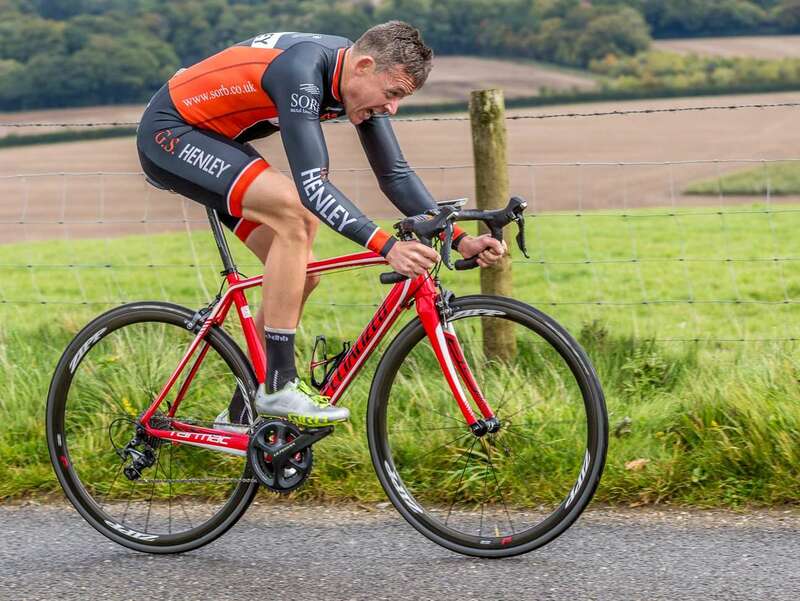 Matt was not the only GS Henley rider to vanquish on the day as Nick Parris also took the top-spot in the come and try it event, with a time of 05:42 – well done Nick!